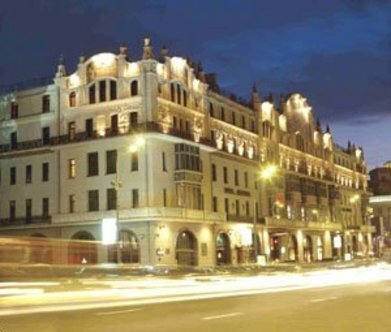 Since its completion the Metropol has always played a greater role in Moscow's life than simply that of a Grand Hotel. It has been a part of history with its corridors witnessing many of the historic events of the century. Designed in 1898 is a 'style moderne' by William Walcott the hotel has had an illustrious history. From the beginning the Metropol attracted the cream of Moscow society Leo Tolstoy and Rachmaninov frequented the hotel, Shalyapin sang here. Bernard Shaw and Bertold Brecht were guests of the hotel. The guest list since renovation boasts names like M. Rastropovich, Monserrat Caballe, Pierre Cardin, Michael Jackson as well as Presidents and Prime Ministers from around the world. The incomparable style of the hotel is nowhere more evident than in its elegantly decorated rooms and suites the careful blending of original paintings and antiques has created a special opulence and warmth. In 2009 the price for Full buffet breakfast at the "Metropol" restaurant per pax will change to RUR 1400 including VAT.